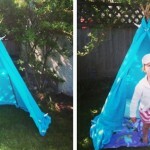 Super Simple 5 Minute Backyard Teepee - Mama.Papa.Bubba. Growing up, my little brother and I would spend a week or two at my Baba’s house each summer. Our days out at the farm were wonderful. We spent nearly all of our time outdoors… We herded cattle, carried huge buckets of grain out each morning, and watched calves being born. We roamed through massive gardens with freedom to pick and eat as much as we pleased. We devoured fresh peas off the vine, ate up buckets of raspberries, and wandered around with long stalks of rhubarb with little glass bowls of dipping sugar. Baba taught us how to use the ride-on mower, make pedaheh from scratch, and draw with artists’ pencils and shading sticks – all of the things childhoods should be made of. 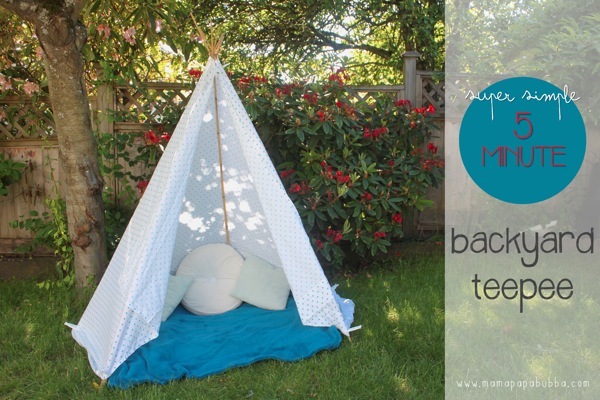 But above all other adventures and activities that took place on that farm, the one that stands out most in my mind – the one that was most anticipated each year – was building a backyard teepee. Baba would take us out into the forest, small saw in hand, and we’d cut down the trees that would form the structure of our new home. 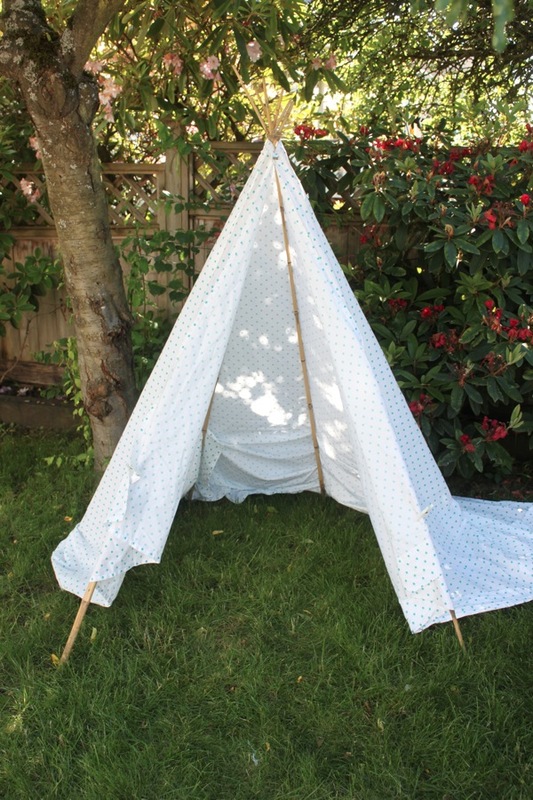 We’d drag them back, position them and tie them up, then drape them in sheets until our teepee was fully enclosed. Perhaps the very best part was furnishing it afterwards. We’d carefully separate the space in half, position our mattresses and end tables (Baba doesn’t mess around), then stock it up with blankets, flashlights, snacks, books, and activities. I can’t even describe how cool it all seemed as a child. 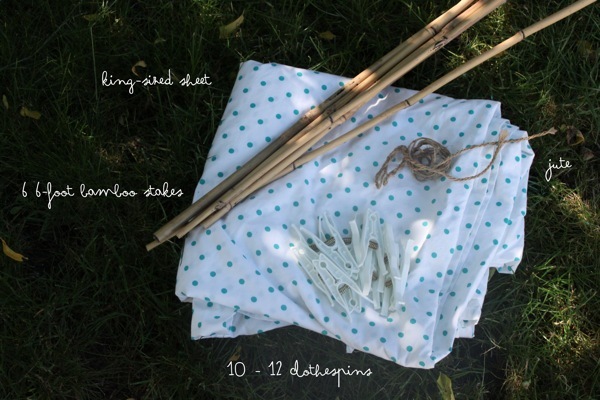 First up, the materials… We use 6 6-foot tall bamboo stakes (purchased at any store that has a decent gardening section), a king-sized sheet, some jute, and 10 – 12 clothespins. 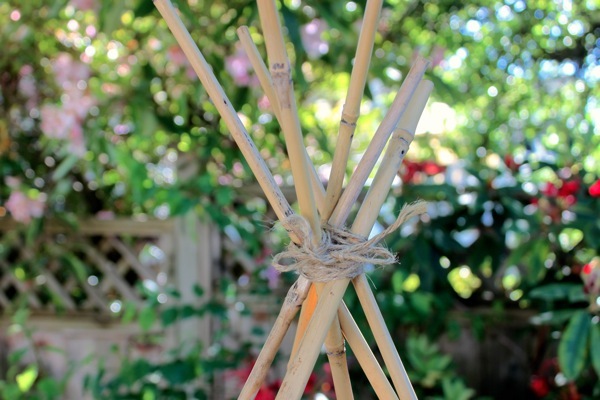 Next, I gather up the top of the stakes in one hand (there really isn’t a right way to do this – I just grab them and how they come together is how they come together) and use the other hand to wrap the jute around. One thing I try to do while wrapping the jute is to weave it in and out of the stakes – this gives it some better holding power. When the jute seems secure, I tie it off in a bow so it’s easy to undo later. With the structure built, it’s time to enclose it with the sheet. To do this, I simply drape the sheet around the stakes horizontally with the ends being at the front opening. To hold it in place temporarily, I bring the two sides of the sheet together at the top and secure it using a clothespin and add another two at the base of the two front stakes. Next up, it’s time fix the positioning a little, smooth everything out, tuck in the extra fabric, and secure it all. I like to start at the front, making sure that both of the front stakes are fully covered and each side has a flap of extra fabric that can be used to close up the teepee completely if desired. 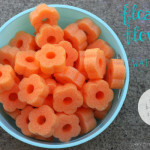 To do this, I just tug and adjust until it’s the way I want it. With the sheet positioned properly, I move to the top and add several clothes pins to secure the sheet to the stakes. I usually use four, but you could put one on each of the 6 stakes if you wanted to. Then I go to the bottom and add a pin to each of the stakes, tucking under the extra fabric along the way if needed. 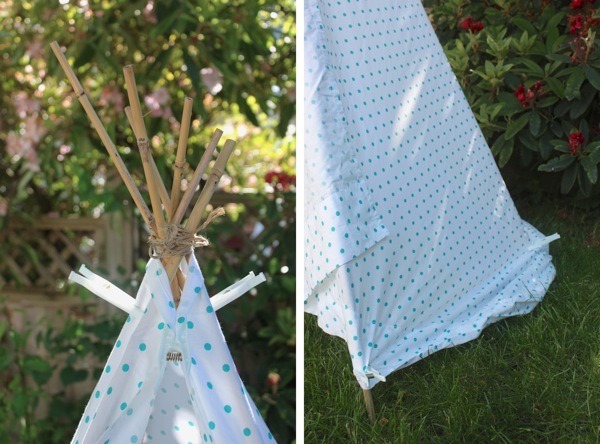 And that’s it – the basic teepee is complete. Super simple, right? To make ours extra cozy, we always add a blanket in the bottom and a few throw cushions along the sides. 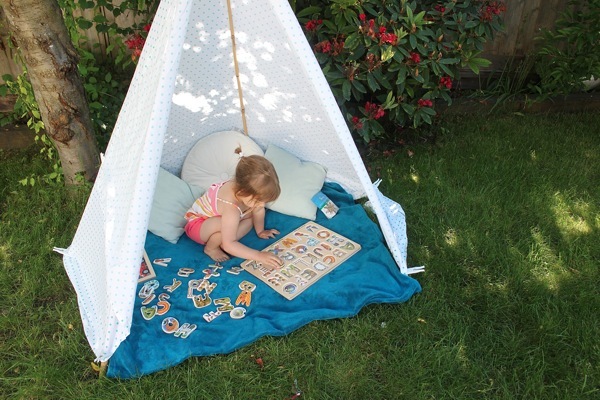 One of Gracen’s favourite parts is selecting an activity to bring into her teepee with her. Most often, it’s a stack of books to read, but today it was a stack of puzzles instead. Awesome!!!! 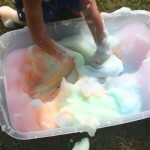 I was going to ask you how you made yours because Elle and I are doing one for our Summer Bucket List. Thanks!!!! Well here it is, Amy! I can’t wait to hear about the adventures you guys have in yours this summer! So CUTE! 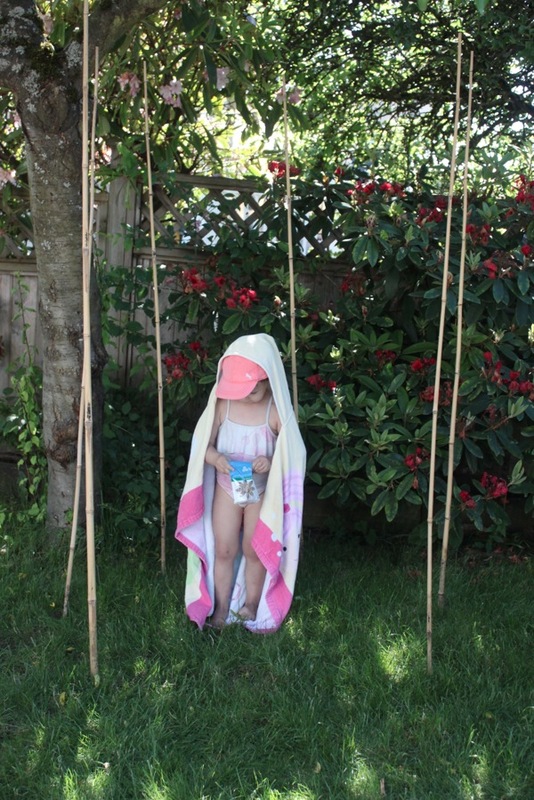 My daughter just went to a “Camping” birthday party (in the bday child’s backyard – it was darling!) 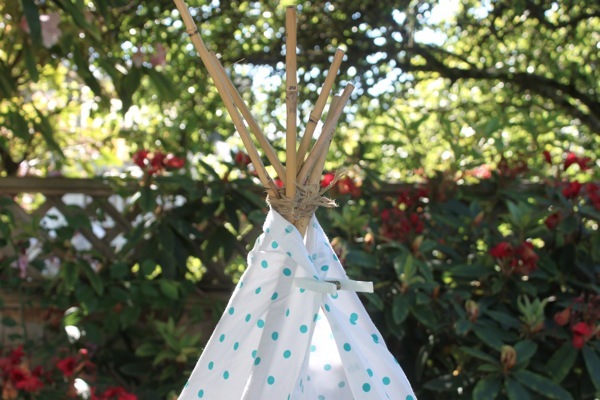 and they had a teepee as well and I asked where they ordered it from. The mom told me her mom-in-law made it (she had been a school teacher) and I was disappointed bc I had no idea how I would make one. Problem solved!Thank you for this idea! Yay – glad I could help, Juliana! Enjoy! Just want to tell you how absolutely amazing this is! I’m SO doing this for the hooligans one day. And your Baba sounds like the most wonderful woman. My Nana was as well, and made huge impression on my life, greatly helping to shape the person I am today. 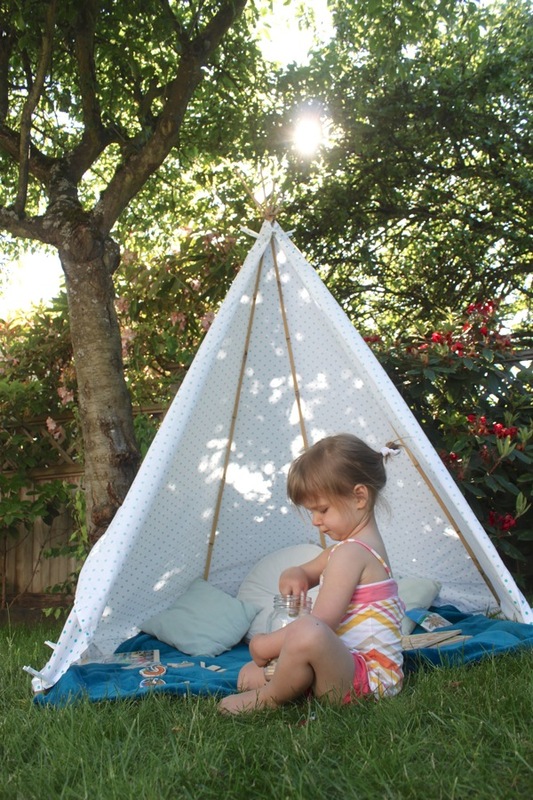 Although I think your Baba might have had one up on her with this teepee! 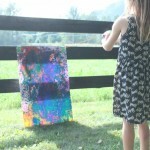 We just made one from recycled cotton curtains. But yours looks a bit quicker to put together! Oooh! Yours is BEAUTIFUL, Rachael! Definitely more of a permanent set up, but I LOVE it! This looks so wonderful. 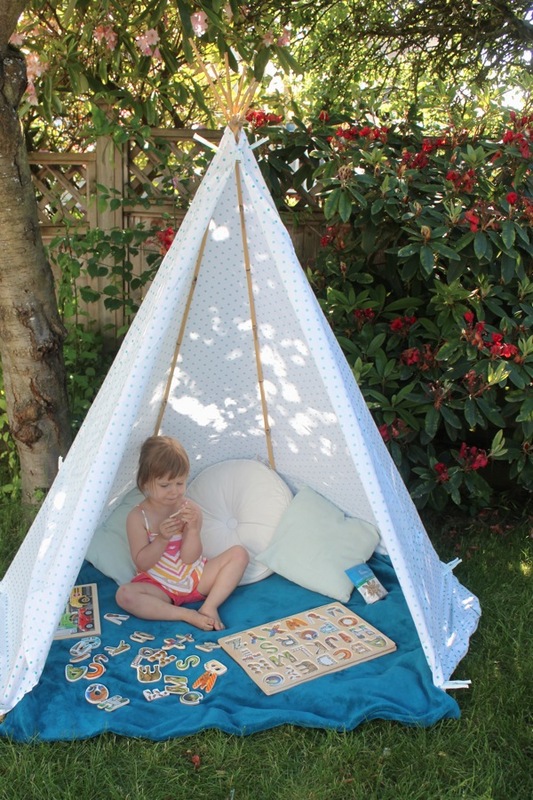 I hope to use it with my tiny granddaughters this summer. 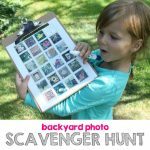 Thanks – found you through Posy Gets Cozy. Thank you, Lorrie! 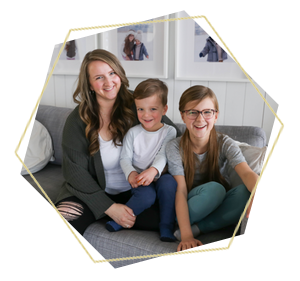 Enjoy both the teepee and your granddaughters and thank you for letting me know how you found me – Posy Gets Cozy is a beautiful blog!! 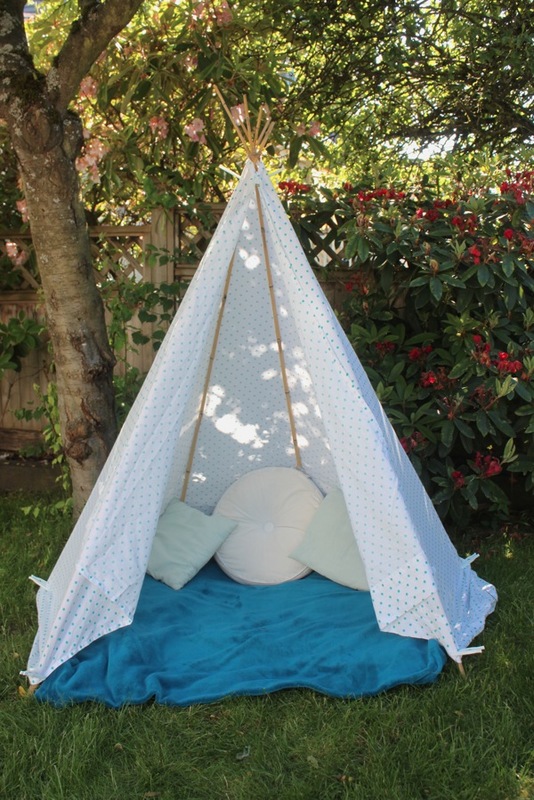 Being A new Nana I cannot wait for my boy to be big enough to enjoy this…but i do know a couple of Princesses that would love this! I also found you through Posy gets Cozy. Thanks, this looks amazing! I am definitely doing it this weekend and leaving the structure up. Such a great idea. Also found you through Posy gets Cozy. 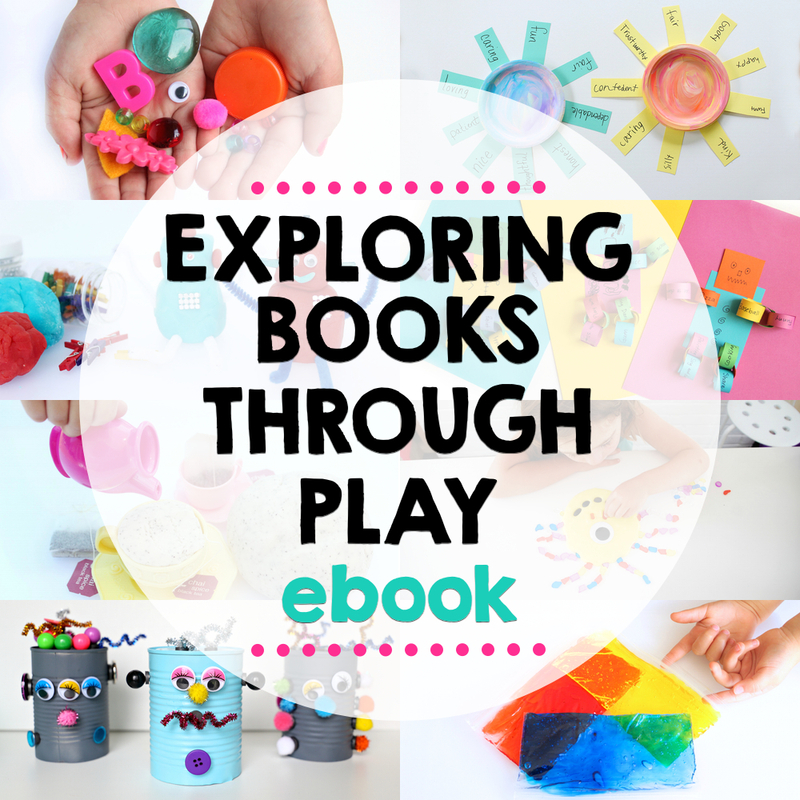 I’m going to have a mosey round the rest of your blog now! Wow, that looks great and you make it look very simple. 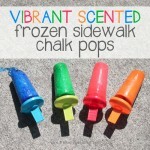 I will have to try it out this summer. I think my two little ones will love it. I did this a few summers ago. Lots of fun. Question though – did your bamboo poles fill up with earwigs?! :/ ours did, and that scared the kids from ever going in the teepee again! lol. Oh my goodness, Lisa! That sounds horrifying – I don’t think I would ever want to go in the teepee again either (I do not love earwigs)! That has never happened to us (yet at least) and I hope it won’t. Perhaps moving it to a different spot in the yard would change things? The one thing I am wondering is approximately how far apart to place the poles at the start to ensure it is the right height for the king size sheet to fit as well as possible all the way to the base? Looks easy to put together! 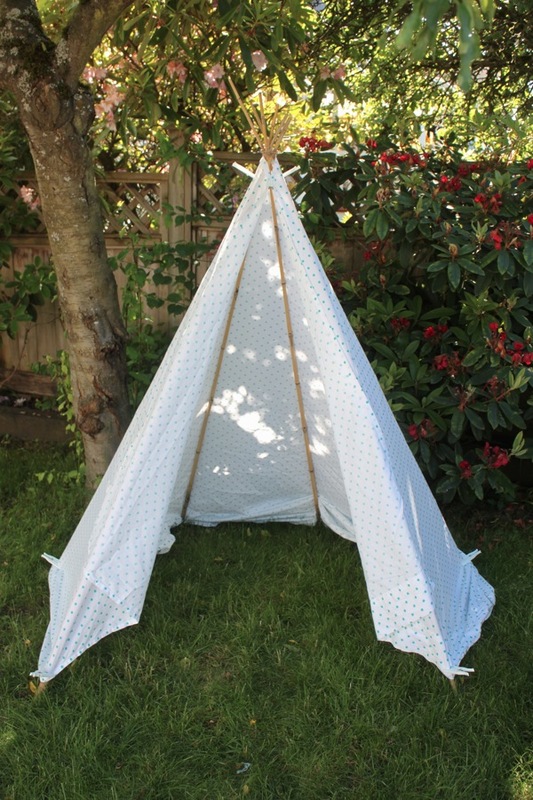 Sorry if I have overlooked this information-but is the teepee collapsible?